One of my favorite parts about summer, is that the kids are with me most of the day. It is comforting to know where they are and what they are doing. Sending them back to school makes me nervous. I am a worrier by nature, so when we are a part I stress about what they might encounter. And I worry about strangers. Stranger Danger is real, and it is a hard topic to discuss with our kids because we don't want to scare them. Start by helping your children understand what a stranger is. A stranger is anyone that your family doesn’t know very well. Strangers don’t have to look mean and evil like TV portrays. It is important for children to understand that. 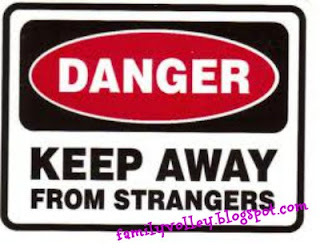 Next, distinguish the difference between bad strangers and safe strangers. Safe strangers are those people that our children can go to for help. Firemen, policemen, and teachers are good examples of safe strangers. Talk about the safe strangers in your community. They need to get away and tell an adult immediately. This also means explaining to them that they won't get in trouble for "telling on" an adult. Emphasis that they will never get in trouble for "disobeying" and adult when any of the above situations apply. · A stranger asks your child if they want a treat or candy. Talk to your child about what to do if they are ever faced with one of these situations. Never get close to the car, or the stranger. Keep your distance. Yell “No” as loud as you can and run away from the stranger. Tell an adult, or safe stranger what has happened right away. Practice possible dangerous situations so your children know what to do. This will give them more confidence if the situation ever presents itself, and will give you a little peace of mind as you send them out the door each day. What have you told your children about Strangers? Is it hard to talk to your kids about strangers? It it already Tuesday. What are your plans for the week? Great ideas. Not sure why I never thought of role playing. We'll be doing that this week. I also try to emphasize that they never go with anyone (even if they know them) if I have not told them too. Maybe I worry way too much. I get a little panicky when I think of what my kids could encounter without me. We talk about this a lot, but now I know what we're doing for Family Home Evening next week. Recap from family volley! Thanks Heather! Glad the info is helpful! I get panicky also. Sometimes I just want to avoid the topic because it is scary to think about. But, by talking we actually empower our kids and ourselves. So happy you don't have to think about what to do for FHE next week. :) Already planned for you. One less thing to do this weekend. Yeah! What a timely topic! Someone tried to abduct one of my daughter's friends a couple of weeks ago right behind our elementary school. Then, the next week, someone matching the same description tried to grab a child at the elementary school that is closest to ours. So, there has been a lot of talk and instruction both at the school and here at home. We're praying that this person is not successful and gets caught soon. So grateful that both times the girls knew what to do and got away. Lolawid, what a scary situation. I hope that whoever is responsible is caught quickly. What a great success story though. To hear that those girls knew what to do. There is great power in talking to, teaching and role playing with our children. Thanks for sharing! One of the things that Cub Scouts taught us to help the boys was not to call them strangers since there are some strangers that you want your kids to go to if they need help, like employees at a store, police, fire men and stuff like that. But to instead talk about "tricky people", people who will try to trick you into doing something that you shouldn't do like going with them. And I like that a lot because you can expand tricky people into people who try to talk you into doing things that you shouldn't do like drugs and other things besides just abduction situations.